Queen Elizabeth II welcomes America's daytime TV Queen Katie Couric to tea. Click here for more image. This year’s first summer garden party in Buckingham Palace marked the meeting of two of the world’s most popular queens. 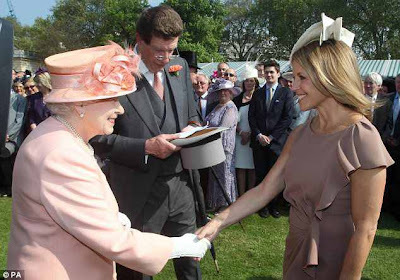 America’s daytime TV queen, Katie Couric, was overwhelmed to meet Queen Elizabeth II for the first time. She wore a short-sleeve taupe chiffon ruffle dress, matched by a simple cream hat and simple accessories. Meanwhile, Her Majesty matched the sunny weather and her more-than-fine mood with a lively calf length peach coach with matching hat, and a pair of white gloves.